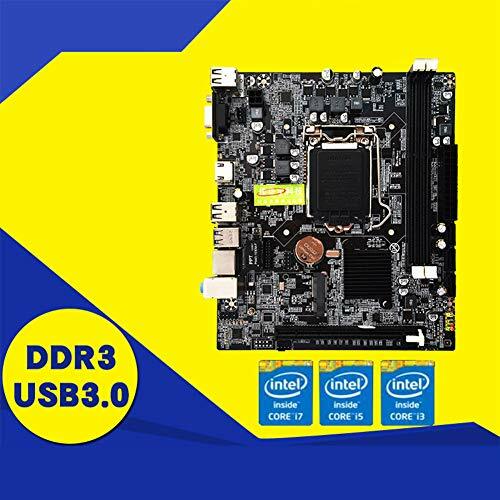 Motherboard chip: integrated chip sound card / network card, nuclear graphics card, main chipset Intel H110, network card chip integrated RTL8105E 100M NIC, audio chip integrated 6-channel audio chip. Processor specifications: 6th generation Core i7/i5/i3/Pentium/Celeron, CPU slot LGA 1151, 1 CPU support. Memory specification: memory type DDR3 1600/1333/1066 MHZ, memory slot 2 × DDR3. Expansion slot: 1×PCI-E X16 graphics card slot, 1x PCI-E X1 slot, 1x USB2.0 pin, 1x USB3.0 pin, M-SATA 1, 3xSATA2.0 interface. Important reminder: The color of the slot bottom plate may be different for each batch. The product is continuously optimized and upgraded. If the details are not adjusted, please update the page description. Please understand!